The success of deploying a hyperconverged infrastructure (HCI) depends on reliable servers that ensure your business-critical workloads run without interruption. So, when it comes to HCI deployments, what if you were given the flexibility to choose the model that best suits your business needs? 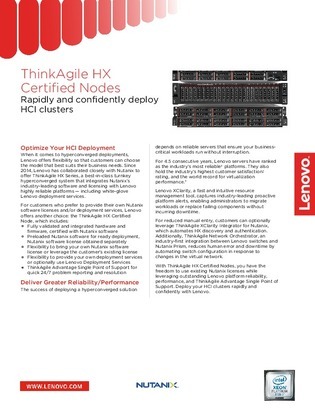 Download this paper for an overview of Lenovo’s ThinkAgile HX Certified Nodes, a turnkey HCI solution with four models so you can rapidly and confidently deploy HCI clusters that suit your environment.